Any parent knows, it's much easier if school clothes are picked out the night before or even at the beginning of the week. Another one of my great ideas! I have tags in the closet for the 5 days of the school week! Sissy and I pick out her school clothes on Sunday for the entire week. Each outfit (shirt & shorts/skirts) is hung in her closet in front of the tag for the day it is to be worn, like this (left image)! Sissy is too short to reach clothes hung on the regular bar in the closet, so we put another one down lower where she can reach. 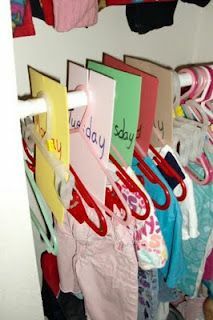 The tags hanging up have the days of the week written on them, so each day Sissy knows which outfit to put on when she gets herself dressed in the morning! I made the tags out of simple craft foam sheets. Cut a slit down from the top, then cut a circle. Think of it like a door knob sign. I actually did something very similar. My boys have a hanging canvas closet organizer. Up til now I've always used it for all our baby stuff. Now that there's no baby, I found a different use for all the cubbies on that organizer. There are 6 cubbies so each day of the week has the change of clothes for that day complete with underwear. My little guy is only 4 so this is a big help in getting him ready. Every sunday he gets to pick out the clothes he's going to wear next week and we put them in the cubbies. Great idea! Does she ever change her mind and switch days?